You’ve had quite a journey with yoga. Where did you first start and what attracted you to the practice? A friend took me to a Bikram class. I taught group fitness, so the hot, sweaty type of yoga made sense to me. I loved the way I felt after a class. I continued practicing hot yoga for years but gradually moved toward different styles. Where else are you invited take child’s pose or savasana in the middle of a class! The depth of yoga keeps me returning to my mat. I always know that when I take a class with you, I’ll leave more balanced than when I walked in the door. And as a teacher, you’re firm and direct, yet deeply compassionate. How do you stay centered so that you can give all that you do during class? First, thank you for the compliment. I truly love teaching yoga. The more years I teach, the more I trust my knowledge. I practice and continue to study with other teachers. Being a student makes me a better teacher. I wish for all those in my class to glimpse their light through my eyes — we are often harsh judges of ourselves and need to be reminded of our awesomeness. There’s a long line of extremely reputable and respected teachers you’ve sought out for ongoing education. Tell us about your teacher training in Chicago and the on-going study that’s a part of your current path. I did my teacher training with Daren Friesen through Moksha Yoga. During our training we had the opportunity to take workshops with many renowned and knowledgeable teachers from different lineages. This provided a wonderful breadth to our training. Currently, I take class and apprentice with Gabriel Halpern of Yoga Circle once a week. Taking his class has made me physically stronger. Apprenticing is a wonderful challenge. Gabriel’s ability to see small asymmetries in alignment and help a student inspires me. His willingness to share what he has learned humbles me. Your study goes so far beyond yoga. Give us a snapshot of your background from fitness to massage to nutrition …. and how have these things influenced your teaching style. I began teaching aerobics in the late 1980s for fun, got certified as a group fitness instructor and continued to teach after I quit working full-time when I had my first child. I was certified in Shiatsu massage in 1992. In my late 30’s I went back to school to study dietetics with a plan to be a registered dietician. I was very involved with the creation of the Davis (CA) Farm-to-School program in which we supported school gardens, created Farmer’s Market salad bars as part of our school lunch program, and farm visits for each second grade class in our district. My family made the difficult decision to move for my husband’s job. Unfortunately, my program of study was not available in this area, so I could not finish my dietetics degree. Needing something to keep me busy as my kids were older and I was new to the area, I decided to get my yoga teaching certification. Yoga is a perfect fit for my holistic view of healthy living. The Yamas & Niyamas are a wonderful guide — moderation, contentment, self-study, etc make sense to me. Whether it’s taking time to just breath, meditate or eat a cookie, I want to savor it all. Anyone who knows you, knows you are at home on your horse! Tell us about your beloved Bodhi and how yoga goes hand-in-hand with your other favorite pastime. Bodhi! One of my greatest teachers. He is a 16-year-old gelding with lots of personality. I practice natural horsemanship and enjoy trail riding. When he gets nervous, I have to remember to breathe. When he is unsure, I have to be firm. When he is relaxed, I have to enjoy the moment. All things that I find challenging for myself. He is definitely in my life for a purpose. I am blessed to be able to spend time in nature with such a beautiful creature. Family life clearly keeps you centered — and you do it so well. Tell us about your jet-setting husband and children and how they keep you grounded even when they are scattered in far away places. You are right, my family is my polestar. My husband, Scott, travels frequently for work (in the US and Europe) but does come to yoga class when he’s in town. My son, Connor, is 23 and lives in Bozeman, Montana studying to be a Special Education teacher. Connor is always up for anything. 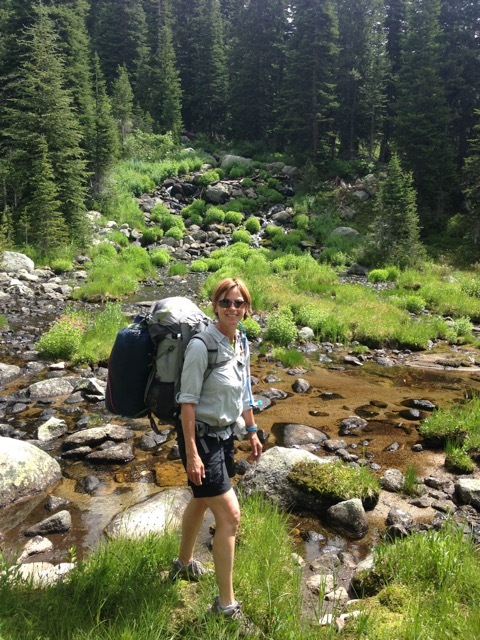 He is a great backpacking buddy — as I get older, he carries more weight! We both find our peace in nature but especially in the mountains. My daughter, Eliza, is 21 and a student at Butler University (Communications & Spanish). She is fluent in Spanish and studying at a Spanish university in Murcia, Spain this semester. She has already led yoga on her rooftop terrace and spread her love of essential oils. We like to hike, drink coffee and shop together. We all spent two weeks together in Montana over Christmas and will all meet up in Europe in June. I love nothing more than when the four of us are together. Food, glorious food! Please share how you make a vegetarian diet seem downright delectable. I definitely show my love through my cooking. I’ve been vegetarian for more than 25 years and love it when someone enjoys my food. I never met a recipe I didn’t want to play with. (Which is why I’m not a baker — exactness is not me). I think of a taste or have something in the fridge that “would be great in this recipe” and I throw it in. The downside is I often don’t remember exactly what I did when I’m asked to recreate it!